An IEEE 802.15.4 compliant single chip combines an ARM® Cortex®-M0+ based 32-bit microcontroller and best-in-class 2.4GHz RF transceiver. It offers an excellent RF performance, with a link budget of 103dBm while consuming 50% less active current than existing offerings. The device features IEEE 802.15.4 MAC hardware accelerators and automatic transmission modes, wake-on-radio, offers twelve-channel direct memory access (DMA) controller, up to four configurable SERCOM modules for I2C, SPI and USART and a 128-bit AES crypto engine. The device features further blocks like a Peripheral Touch Controller (PTC), Full-Speed USB Device and embedded Host and hardware components to support RF distance measurements. To complement that set the SAM R21 also supports external power amplifiers and antenna diversity. 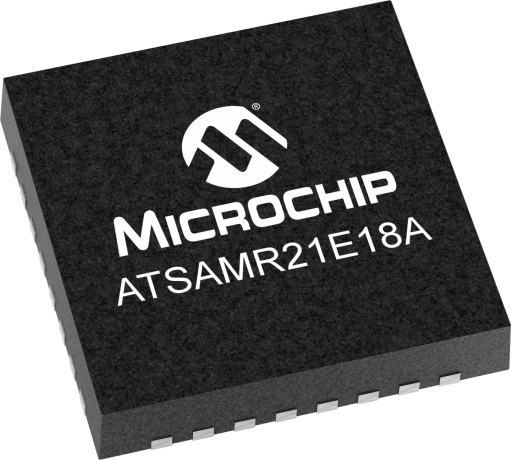 The ATSAMR21E18A is available in a fully-certified module, ATSAMR21B18, optimized for zigbee lighting designs. Visit the module product page for more information. Microchip's complimentary and confidential Wireless Check online design review service is available for customers who have selected our products for their application design-in*. *The online design review service is subject to Microchip's Program Terms and Conditions and requires a myMicrochip account. Battery case with room for 2 AAA type batteries. Can act as a power source for kits that need a 3V power source through GND (black wire) and VCC (red wire) pin. Battery case with room for 4 AAA type batteries. Can act as a power source for all kits with mini USB connector. Also possible to connect via GND (black wire) and VCC (red wire) pin or by soldering wire directly.